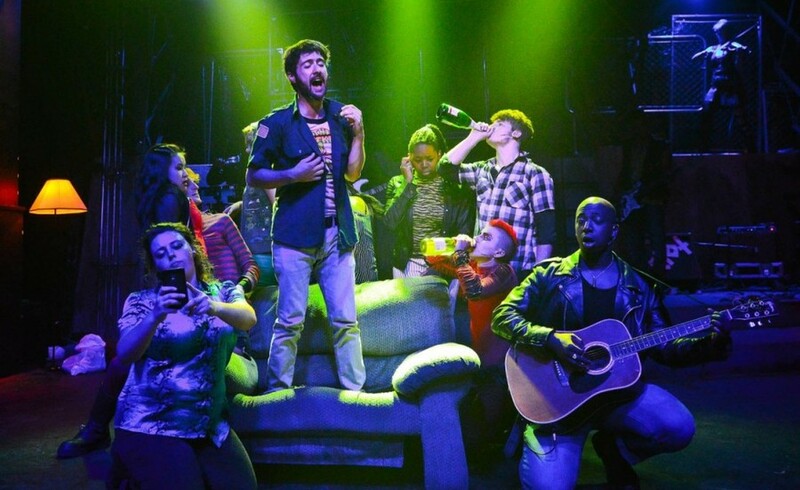 This past Saturday I travelled to Wicker Park’s Den Theater to see The Hypocrites’ take on the successful Broadway musical American Idiot. The musical, written by Green Day lead singer Billie Joe Armstrong and original director Michael Mayer, follows the lives of three friends who are trying to escape their boring suburban lives...and is entirely guided by Green Day songs. What particularly struck me about this performance was the set. The interior of the theater was covered in graffiti, and there were seats on three sides of the stage with a large open space in the middle. An asymmetrical stage with all the necessary instrumental equipment was set up behind the empty space on the only side without an audience. The edginess of the set underpinned the conflicts unraveling on stage, with the three friends experiencing distinctly dissimilar paths. Two friends leave the suburbs, and one’s “dreams turn red, white and blue” as he joins the military, while the other finds comfort in heroin and experiences of lost love. The third friend stays in the suburbs in hopes of making a future with his pregnant girlfriend, but life doesn’t turn out quite as he hopes. In addition to the gritty set, I was impressed by the immersive costume choices. While the majority of “chorus” actors were wearing punk outfits reminiscent of Green Day itself, the three friends went through costume changes that reflected their changing lives. The friend who joined the military transitioned into a military uniform, the friend who started taking heroin wore costumes with red accents, and the friend who stayed behind in the suburbs wore a regular black sweatshirt and pants combo that was distinctly less punk than the rest of the cast. Most of the actors on stage were part of a “chorus” that fulfilled multiple roles, including singing and playing instruments. This was a particularly entertaining part of the show, and I always found myself looking forward to hearing a new performer’s vocal ability as each one took a turn in the spotlight. My only criticism is the sound mixing throughout the performance: only the instrumentally-quieter songs let the audience hear the lyrics and the powerful vocals that all of the actors undoubtedly possessed. However, during more upbeat songs, the vocals were lost underneath layers of drums, guitars, and keyboards. All of the performances themselves were strong, with each of the three male leads bringing his own unique energy to stage. My personal favorite, however, was the actor who played addiction personified: Malic White, a transgender figure whose red mohawk, petite build, and physical seduction embodied the enticement of heroin itself. Regardless of whether you’re a Green Day fan or you preferred bumping to Christina Aguilera during your middle school days, this musical proves entertaining in all respects and is definitely worth 100 minutes of anyone’s time. Friday, October 16, 8 p.m., $10 with UCID, transportation included.